The XPC nano is Shuttles smallest product lines with only palm size. 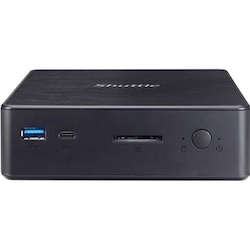 Shuttles new NC02U series is next generation of NC01U series with support Intel Skylake-U platform technology. This series comes with a selection of processors ranging from Celeron, to the Core i7 and supports up to 32 GB of DDR3L 1600 low-voltage memory.